I’m thinking lots of people knew this but it’s new to me. 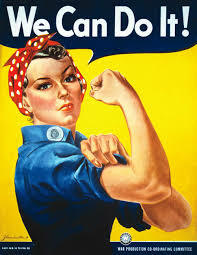 The woman featured in the iconic “We Can Do It!” wartime poster is not Rosie the Riveter. More on her later. The “We Can Do It!” poster was an internal job in a series for Westinghouse employees grumbling about wartime work hours and union suppression. Most of the posters in the series featured men and it’s unlikely that viewers in the one week this poster was scheduled to be on display in Feb. 1943 would have seen it as a call for women to join the war effort. They were already in the effort. 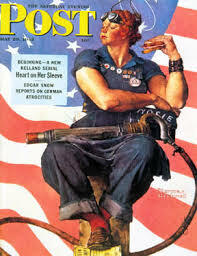 Norman Rockwell’s Rosie is a real gal, chowing down. Notice her foot on Hitler’s Mein Kampf. Don’t mess with this Rosie. She’ll chew you up for breakfast and spit out the pits. It sure is fashionable to put down Rockwell but you just can’t beat him for pictures that tell a story.